Would You Read It Wednesday #141 – The Trouble With Keeping Vikings (PB) PLUS The June Pitch Pick! Would you look at this? It’s Wednesday again! Where does the time go?! First, it is my pleasure to announce that the winner of the May Pitch Pick is Todd! Congratulations on an intriguing pitch, Todd! It has already been sent to editor Erin Molta and I’m sure you will hear from her shortly! Congratulations to all our other pitchers as well – you all did a terrific job! Even with such a helpful and generous crew of readers as we are fortunate to have over here for Would You Read It, it takes a lot of courage to post your pitch for people to comment on. I know I speak for everyone when I say you are very brave and committed to honing your craft and we all applaud you for it. Let’s skip merrily on to the June Pitch Pick now. Sprinkles the Clown wants to fit in with her classmates on the first day of Kindergarten, but when her show-and-tell juggling act goes wrong, all the kids laugh at her, in a way even clowns don’t like. However, as a storm rolls in scaring all the students, Sprinkles puts her own fears aside and uses one of her true clowning skills to save the day! 4 year-old Gia and her mother marvel in the changing seasons from their house on the hilltop until dandelion wishes disappear, and with them Gia’s sense of magic. She finds it again in her first experience of snow. A lyrical, share-able picture book at 578 words, Dandelion Wishes celebrates the everyday magic of nature and family. Seventeen year old Aria Perin spent her life running from her mother’s demons. That is, until her mentally ill mother attempted to commit suicide. Now, Aria has awoken in the strangely familiar parallel world, Immortal Island, where life is eternal and her mother’s imaginary monsters lurk everywhere. Her arrival has set off a chain of events that leads to the destruction of Immortal Island. The evil ruler seeks to slaughter Aria with hopes of saving her people and regaining her seat of power. Against his mother’s command the ruler’s son, Julian, vows to protect Aria. He leads her to bargain away the life of an undiscovered sibling to cursed Muses, swim with flesh eating Sirens and cross hell to battle Nymphs of the Underworld all for the obscure hope of returning her home to safety. As the connection between Aria, her mother and the island becomes clear, so does the true nature of the ruler and friends Aria has made. Her discovery will set both the Mortal World and the Immortal World on a path to complete annihilation. As her arrival brought catastrophe to the island, only her journey to find home can set everything right. Brave Addie’s not afraid of the “bad guys” at bedtime. No way! But after a spooky night seeing a bear in her chair, a witch by her light switch, and a ghost eating toast—EEEEK!— Addie decides the way to a bad guy’s heart might just be through his stomach. So, she invites them over for a home-cooked breakfast. And when the troupe of bad guys shows up at her doorstep ready to eat, things can only go one of two ways. Please vote for the pitch you think is most deserving of a read by editor Erin Molta in the poll below by Sunday July 13 at 5 PM EDT. 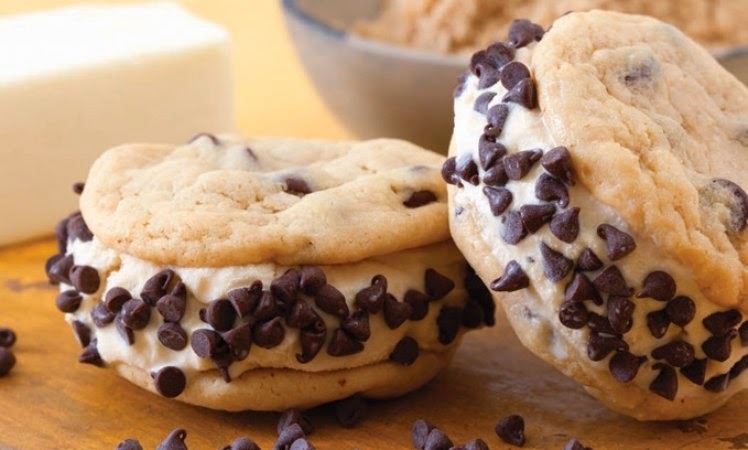 Butterscotch ice cream sandwiched between chocolate chip cookies – YUM! And now that we are thusly fortified and cooled off, let’s have a look at today’s pitch. The Pitch: Having a horde of Vikings come stay for a visit sounds harmless enough, right? Wrong! From snot-snakes to clashing swords, the outrageous antics of these pesky Vikings seem to be never-ending. But who will come to the rescue and bring them under control? Please send YOUR pitches for the coming weeks! For rules and where to submit, click on this link Would You Read It or on the Would You Read It tab in the bar above. There are openings in September so you’ve got a little time to polish up your pitches and send yours for your chance to be read by editor Erin Molta! Brandie is looking forward to your thoughts on her pitch! I am looking forward to catching up on all the work I didn’t do while I was driving around the eastern seaboard! Would You Read It Wednesday #142 – Sophie Vs. The Monster (PB) PLUS The June Pitch Winner!!! Thanks for your very thoughtful and helpful comments for Brandie, Michelle! Thank you so much for your helpful suggestions for Brandie, Annie! Water is important in hot weather, Jill – almost as important as ice cream 🙂 Stay hydrated! And thanks so much for your insightful comments for Brandie! Thank you so much for your helpful suggestions for Brandie, Johnell! And yes! Suggestions are always welcome – that is how we learn! – as long as they are given in a spirit of helpfulness as yours are. Thanks so much for chiming in! One of these days I'm going to see a moose… just hopefully not at 60 mph in front of my car! 🙂 Thanks so much for your thoughtful suggestions for Brandie! I'm so glad you enjoyed the ice cream treats, Angela! That is why they are here 🙂 Thanks for voting and for your helpful thoughts for Brandie! Thanks so much for chiming in with all your helpful thoughts, Sue! Such a good point, Genevieve! Thanks so much for chiming in for Brandie! Come by anytime! It is certainly worth a visit (at least once), and I can promise lots of chocolate. The moose love to be right in the middle of town (no fence is high enough to keep them out). In fact, one came by when we were playing with the kids at a play ground. I put it at the end of my welcome video for my site. Now I've seen it! That was amazing! The moose just walked right by! Was that a big moose or a little moose? It was a little one (a yearling) if you can call any moose little. It was close. The kids were safe up at the top of the jungle gym and had a great view! I'm late to the game, but I agree with much of what I'm reading here in the comments. The idea and imagery is great – I adore the “snot-snakes,” for example! It alsp seems very marketable and fun! However, it would be a much better pitch if it was in a more active voice. You can try breaking it down to ABC's (Actor, Behavior, Condition) – as in “Tommy (A) must convince the pesky Vikings to mind their manners (B) before his mom comes home and finds the mess (C). Keep that very simple and direct, then add the imagery and adjectives you need to give it a voice that matches your story. YES!!! OF COURSE I WOULD READ THE BOOK!!! I LOVE vikings! 😀 This book sounds hilarious! Great food choice, Ms. Hill! “MC's name” wondered how he ever could've thought a visit from a horde of Vikings could be harmless. I knew you would like this idea, Erik! 🙂 And the snack! Thanks for your comments for Ms. Reedy! Thanks so much for your very helpful suggestions for Brandie, Maria! Very helpful, Katey, thank you for chiming in for Brandie! Yeah, I thought maybe it was young… hence its visit to the playground 🙂 So awesome! This sounds like a really funny book that boys would love. Sure, I would read it. I agree what others have said about having a more active voice. I haven't seen a moose! On our road trip though we saw plenty of moose crossing signs. My hub really wanted to see one. I did too, but not on the road while driving! You need to visit me, Susanna. I saw a young moose in my neighborhood last year while I was going for a run. Fortunately it didn't have any antlers yet. Ha! Okay. My son would think that was funny.